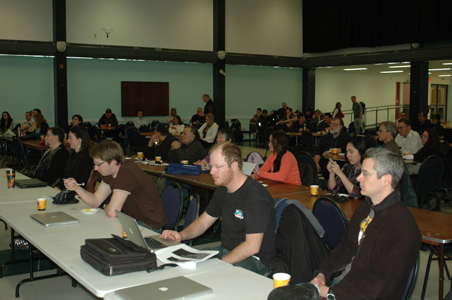 The IRIS 1 Regional Workshop was held in Inuvik, NT, April 11-15, 2011. The objectives of the workshop were 1) to communicate research results to representatives of the Inuvialuit Settlement Region (ISR) and the Kitikmeot region of Nunavut and 2) to educate one another about the IRIS framework and its goals while advancing the development of the IRIS 1 regional impact assessment through informal and break-out group discussions. During the first two days of the workshop a Community-Based Monitoring (CBM) workshop organized by the Fisheries Joint Management Committee (FJMC) took place alongside the IRIS 1 Workshop. With over 100 people in attendance, including approximately 30 community members, nearly 30 research and CBM presentations facilitated much information sharing and discussion among the participants. The remainder of the IRIS 1 workshop featured presentations outlining the overview and goals of the IRIS 1 regional impact assessment, followed by break-out group discussions to identify regional climate change priorities and improve the overall outline of the IRIS 1 assessment. Since the IRIS 1 Regional Workshop the outline of the regional impact assessment has been revised using the feedback received at the workshop. The next step in the IRIS process is show the revised outline to decision and policy makers in the ISR and Nunavut. To ensure that the assessment is relevant to its users it must be driven by the needs of the regional decision makers. This approach facilitates further consultation to finalize the regional priorities to be addressed in the assessment. Workshop participants of the ArcticNet IRIS 1 and FJMB CBM Workshops, Midnight Sun Complex, Inuvik, NT, April 2011. (Photo credit: Stephanie Powell-Hellyer (ArcticNet).